Ya, I could actually live out of mine. Oh wait, I don’t have a clean underwear in my purse. Maybe not, but I have a toothbrush! Well that concludes my purse items. Dare to share yours? Hope you are having a great weekend. 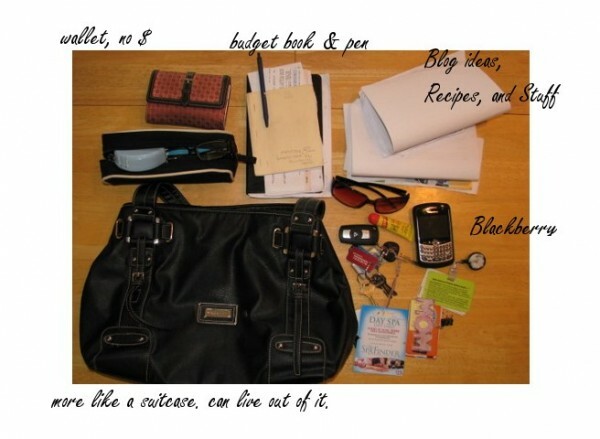 This entry was posted in The Daily Grind on 2009-12-05 by Christine. This is one of those instances where being a guy is a beneficial thing. I carry: keys, sunglasses, wallet. Ya, I don’t know how you guys do it! I envy you guys for so many reasons – this being one of them. Thanks for stopping by! I have to carry the sweet & low. I don’t like Splenda or the blue packaged one (can’t remember the name right now). Sometimes I’ll have coffee somewhere and they mess up and use Splenda instead, I can definitely tell the difference! You mean I have too much stuff in it right? LOL. I’ve tried to empty it but it keeps filling up again! Oh well! Although, for quick trips I tend to throw the wallet, keys and sunglasses. This big bag is more during the week traveling to work bag. Will you please tell me where you had read or seen the information for banks not coming after you in the state for Florida for the difference after a foreclosure. If you have the link that would be great!!! Greatly Appreciate It! Janusin, I am sorry. I think I briefly remember talking about foreclosure on a blog and that there is a bank program allowing a homeowner to walk away from their home and recieving money for it. But I do not know anything about the state of Florida not coming after you for the difference in a foreclosure. Wish I could help. If I do find something, I will be sure to email you with the information.